Look out! The queers are taking over Westside for stand up comedy that couldn’t be straight if it tried. 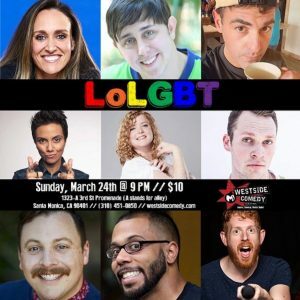 Join some of the best LGBTQIA comedians for laughs, fun, and unique perspectives. It will be a gay ole time! THIS SHOW IS 21 AND OVER. PLEASE BRING A VALID I.D. LINE-UP SUBJECT TO CHANGE. IF YOU ARE NOT PHYSICALLY HERE TO CLAIM YOUR TICKETS THEY WILL BECOME VOID 15 MINUTES AFTER SHOW START TIME. NO REFUNDS OR EXCHANGES – THERE ARE NO REFUNDS OR EXCHANGES FOR TICKETS, MERCHANDISE OR CLASSES PURCHASED. ALL SALES ARE FINAL. Posted March 24th, 2019 & filed under Comedy.